Professional air duct cleaning refers to the cleaning and repairing of various parts and components of your ductwork and HVAC system. This includes the registers, grilles, cooling coils, and fan housing, as well as the supply and return ducts. The benefits afforded by these types of services are plentiful, but we thought we'd summarize some of the main ones for your convenience. Residues of moisture, dirt, and debris inside your air ducts can result in the growth of mold and all sorts of other harmful bacteria. Once the air ducts have been invaded by such contaminants, they need to be disinfected. Otherwise, you'll be breathing these dangerous contaminants on day to day basis, and could develop respiratory issues and exacerbate preexisting ones. Making sure all the dirt and debris are removed and the entire system is cleaned by professionals will help to ensure your indoor air quality is safe and fresh to breathe. Aside from mold and bacteria, larger animals, such as insects and rodents can breach and infest your air ducts. Even if after you get professionals to get rid of these vermins, their "leftovers" will have to be removed and the entire system will need to be sanitized. 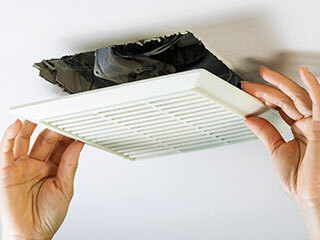 When a blockage occurs inside your air ducts, or when too much dust or dirt accumulates in your air filters, the resault is a reduced airflow. That means your HVAC system will have to work harder in order to compensate, which will result in higher electricity costs. but Another costly side effect will be that different parts of your system will sustain more wear and tear damage and will need to be repaired or replaced more frequently. Once you come to the realization that regular air duct and HVAC system cleaning is necessary, it's best that you don't make the mistake of trying to take care of it by yourself. Aparat from the potentially dangerous contaminants and your lack of experience in dealing with them, you could actually cause further damage to your system by accident, which is why it's best to leave this type of work up to the professionals. Our experts at Air Duct Cleaning Los Angeles specialize in this sort of work, and we can make sure your indoor air quality is greatly improved and that your energy bills are reduced. Call us today.